The Orb Raw is a keychain flashlight, it is very small but very powerful so it's what flashaholics call a "pocket rocket". 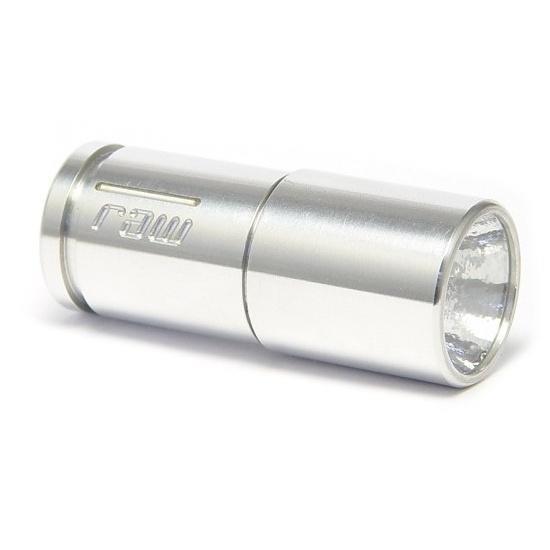 The Orb is a Luxeon III led flashlight driven by a CR2 3v lithium battery. Since the flashlight is very bright you need to use rechargeables. The Orb comes wiht a rechargeable CR2 battery and a nano-charger. You can get a two-stage version with 2 levels of light or just a 1 stage. In maximum power the Orb can outperform very big flashlights, it produces about 80 lumen that is brighter than many many larger flashlights. It has a very big "oooh" factor. The runtime in maximum is about 15 minutes, in the low setting the runtime is a lot longer while still providing plenty of light for most tasks that require a flashlight. Optionally you can add tritium tubes to the body that will act as a locator to help you find the raw in the dark. The raw does not have a hole for a split ring so if you want to put it in your keychain or lanyard you need to buy an accesory lanyard ring. You can order and read more information at the Orb Raw website.